It’s finally here, and while the Atlanta Falcons and the Philadelphia Eagles may not have played the most aesthetically-pleasing game last night, it was nice to see real NFL football back on the football field and on the television screen. As we did a season ago, we’re back to give our best five picks of the week. 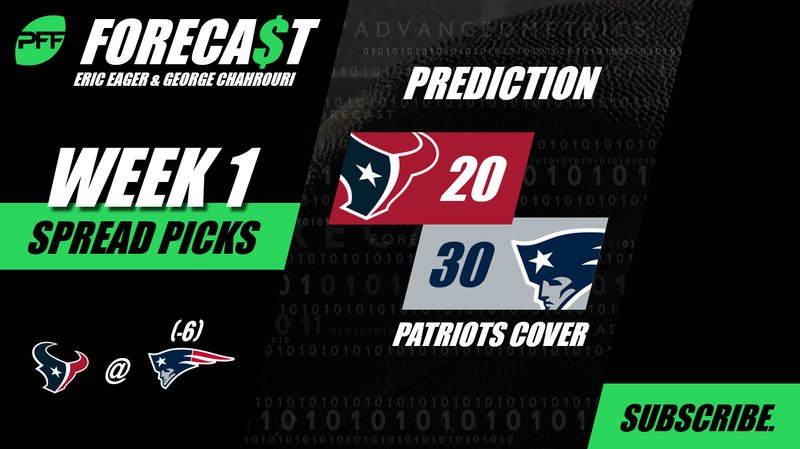 As previously alluded to, these picks are available throughout the week with PFF Greenline, where you can see all of the game’s line movements and our model’s reactions to them and other news (e.g. injuries that cause them). Our models rely heavily on our PFF ELO rating system for the NFL, along with game information like where the game is played, how far a team has to travel, etc. We also fold in opponent-adjusted PFF grades into our machine-learning algorithm to factor in roster changes and possible asymmetric mismatches that can occur through the course of a game. It’s a week for road teams, as we’re going to back Pittsburgh, San Francisco and Seattle. We touch home base with TB12, Bill Belichick and the gang while going back to the well for a TB/NO under. Our picks went 49-37-5 (57.0 percent) in 2017, including 14-6-1 on our “Lock of the Week” and will be printed every Friday afternoon throughout the season. Our analysis will involve a point-counterpoint analysis between the two of us, using perspectives that only the PFF grades and data can provide. Be sure to check out our win totals and picks this offseason and our “way-too-early” look at this Week 1. Follow us on Twitter at @PFF_Eric and @PFF_George, and for some podcast commentary on some of these picks, and the process that goes into them, give the PFF Forecast a listen. All lines are consensus lines, but be sure to check out your options at our sponsor, MyBookie.ag. Point (Eric Eager): We’ve been low on Houston at many times throughout the offseason, and there are a few reasons why. First, Deshaun Watson is coming off of a knee injury, performed much worse than his statistics a season ago show from the perspective of PFF grades, has an offensive line with more holes than the scientific research going into the TB12 method and plays for a team with a defense whose starting outside corner surrendered a 137.3 passer rating into his coverage last season. While there are certainly concerns with Tom Brady’s receiving corps, and the loss of first-round pick Isaiah Wynn, to us this number is an overreaction to the market hanging a -13.5 on the Patriots in Week 3, only to see them barely squeak by with a win. The Patriots roll here. Counterpoint (George Chahrouri): The Patriots under Tom, Bill and Kraft have been tough to beat, but karma is undefeated. Watson and J.J. Watt squash the New England squad when it comes to storing up the only victories that matter, the moral kind. Watson’s inflated touchdown totals are used against him but let’s not pretend that DeAndre Hopkins seeing a 10-plus percent spike in targets with a step or more of separation while Watson is the QB is some sort of aberration. Watson also had the best passer rating from a clean pocket last season (124.1) and while his offensive line couldn’t stop many defensive fronts last season, the Patriots’ biggest acquisition on their pass-rushing unit was Adrian Clayborn, who did the majority of his damage in one game last season. The Texans will keep this one close.